Ancóna was the seat of an inhabited protovillanoviano, then the centre of the Piceni, beginning from the first part of the Iron Age. The Greeks frequented the City before the 4th Century BC, when it became a Siracusan Colony. Conquered in 268 BC by the Romans, it continued to gain importance, until the Emperor Traiano constructed a new port to the East of the Greek one, which included an artificial pier, approximately 300 m in length. The City saw a decline during the late-imperial period, and became one of the main exarchate cities of Ravenna, after the victory of the Byzantines during the war against the Goths (535-552.) Passed along with the other cities of the Pentapoli, to become part of the Pontificate territory (774), it maintained a notable autonomy, competing for commerce against the Saracens, Normans and Venice, with the Adriatic ports. Then counted under the Marca, from which the City derived its name, and enjoying communal freedom from 1177 (only for brief periods being subject of the Malatesta and Francesco Sforza), until in 1532 it passed hands to the government of the Church. This saw a renovation and amplification of its own port, work of Pope Clemente XII (1734), who entrusted it to a special congregation. Conquered by French troops and transformed into a Republic in 1797, then finally annexed to the Italian Reign in 1808, it returned to being part of the Pontificate State in 1815. The City fell into the hands of the Patriots between February and March 1831 and suffered occupation by French troops until 1838. 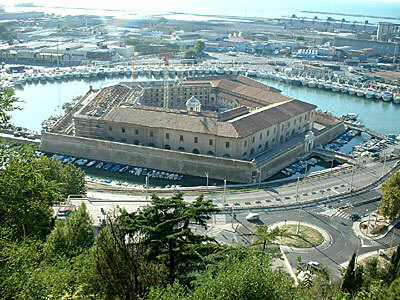 It was then occupied by General Cialdini on 29th September 1860 and finally returned to Italy. During the Second World War, at the end of 1943, it suffered aerial bombardments which damaged it considerably. The damage from the terrible Earthquake of 1972 and the subsequent digs and reconstruction of the City, have determined important archaeological finds: For example, a Picena Necropolis has been discovered; in the Roman Necropolis, amongst the latest finds to be counted, there’s the so called Tomb “of hairdressing,” because of the characteristic instruments discovered there. Traces of an old settlement found in the Colle del Cordeto, are also noteworthy.